Warhammer 40k Forum Tau Online » Games Workshop/40K Related » Terrain » LEGO Bunker FTW! Here&#39;s a picture of my LEGO bunker. Some credit to my brother who helped me find all the bricks in the massive bucket the LEGOs are in right now. There should be more pictures but they are lost somewhere in cyberspace and so you&#39;ll have to wait. The other pictures show the whole thing more intricately, like the window and the other side, but what can you do? But here is one that I do have. If you can make out the Space Wolves, they&#39;re there for a size reference. I personally like it, shave off all the little button things on top prime &#39;er black and add Imperialish banners, emblems ect. and it will pass for a normal bunker. P.s. The right side doesn&#39;t have any firing slots? It&#39;s just for causal games so I don&#39;t think people will care much about the little button things. The right side doesn&#39;t...its a strategic bunker, you can have the big window where you can get shot at, or you can pile your guys into the smaller, 90% protected right side. The Dread was painted by me, but the base isn&#39;t mine. Whoever sold it to me on eBay must have made the base. And they did a really really good job. I love it. I like it. I should break out my old Legos..
Be warned, you&#39;ll probably get flamed by a few of the older gamers, stories about Lego baneblades and soda can carnifixes, but I still like it. True, but there is a difference between a LEGO Baneblade and a LEGO Bunker...especially since I built this one more or less to scale...as you can see. HAHA!!! 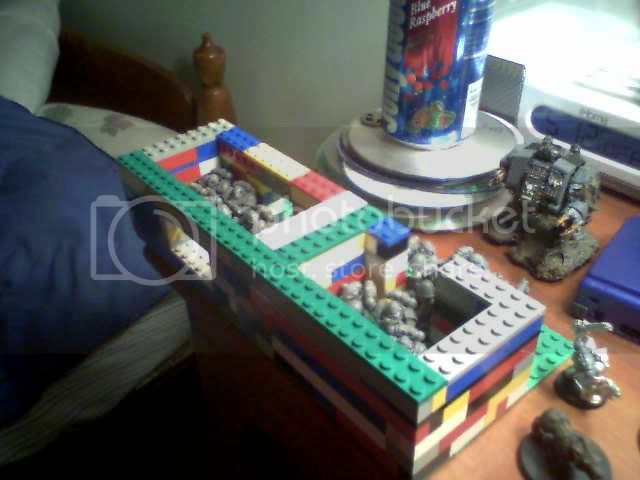 I built two identical lego bunkers about a year ago, for an equal battle of course, although they&#39;re not nearly as big as this one, they do have a few amenities, such as a second floor with communications and a ladder. A hint for those prosepecting to build their own bunker, two standard blocks stacked on top of each other is about the height of a firewarrior of space marines gun to fit into. So it looks like perfect cover since only the gun and head is showing. Yeah, I actually tried to make a second story, but couldn&#39;t really find a way to make legit stairs and stuff. The part without a window actually started out as the foundation for a second story, then my brother and I gave up and we just went with this design. I think I have an idea for stairs though now...I&#39;ll add a new pic if we ever get around to it. Lego was always one of my favorite toys as a kid. Actually I think I&#39;ll have to experiment with making some big 2 and 3 storey buildings for CoD using Lego. Shouldn&#39;t be too hard and could be really rewarding.